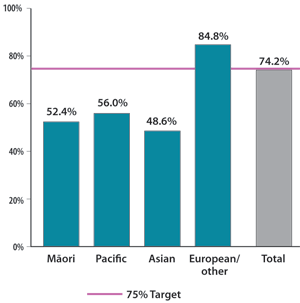 Cervical screening rates in New Zealand have continued to increase following the introduction of the National Cervical Screening Programme in 1990. The current (2010) PHO Performance Programme (PPP) target is for 75% or more of eligible women, enrolled in the practice, to have had a cervical smear recorded in the last three years. Improving quality of care for Pacific peoples cannot be addressed with a “one size fits all” approach. The cultural identification and needs of Pacific peoples are diverse and changeable. In addition, the barriers faced by an immigrant Pacific person may be quite different from those faced by a Pacific person born in New Zealand. Attention to individual factors and multiple approaches are likely to be more successful. There is limited research relating specifically to the barriers that Pacific women may experience in accessing cervical screening. Barriers such as shyness and cost may prevent women of any ethnicity from having regular cervical screening, while other barriers may be more specific for Pacific women. To ensure the disparities in cervical screening are overcome, it is important that any barriers are identified. Be considerate of the power imbalance and a fear of loss of control in what is perceived to be a smear-collector controlled procedure. A clinician who is not rushed is likely to have more success with women who have previously avoided having a cervical smear than someone who is time-pressured. While it is important to be aware of the barriers to cervical screening for Pacific women, knowledge alone is not sufficient to overcome them. Planning at a practice level is necessary to address disparities. It is important that any intervention is carefully targeted to the women that need it most. The first step is to invest time in establishing an effective relationship. Talk to Pacific women in your practice and try and understand what is important to them. It may take several consultations before some women are ready to have a cervical smear, but it is important to acknowledge their concerns and fears, and provide clear information about the procedure. Many women have concerns about having cervical screening performed. Therefore it is important the experience is as positive as possible. Women who have a positive experience are more likely to return, and to encourage their friends and family to attend. Some women may not want to have a cervical smear because this acknowledges that they are sexually active, particularly if sexual activity outside marriage is viewed as unacceptable by their family.7 This may be a particular issue for younger women, or women that know someone in the practice. Women should be reassured that the consultation is entirely confidential, and that all health workers are bound by that confidentially. Remind them that they do not need to disclose to others the reason for their consultation. It may be worth discussing what an appropriate response could be if family or friends ask why they have attended the practice. It is strongly recommended that all women who have ever been sexually active (even if not currently sexually active) have regular cervical smear tests from age 20 to 69 years. Women aged 70 years and over who have never had a cervical smear test are advised to have a smear test followed by another a year later. If both tests are normal, no further tests are required. At the first ever smear, or if more than five years have elapsed since the previous smear, a second smear is recommended one year after the first, with three-yearly smears thereafter. If language is a barrier, try to provide access to a smear taker with appropriate language skills. If this is not possible, consider using a telephone interpretation service. Language Line is a service managed by the Office of Ethnic Affairs and funded by some PHOs. An interpreter can be available via the telephone almost immediately, with 40 different languages available, and a choice of gender. The cost of having cervical screening may be a barrier for many Pacific women. Some PHOs have initiatives in place to provide free or low cost cervical screening. Practice Nurses, Pacific providers or family planning clinics may offer a lower cost alternative. There may also be assistance available for transportation. Become familiar with the services available in your area and ensure the patients who would benefit most have access to these services. Place an alert on the medical record, so the issue can be discussed when the patient next attends. To order resources, visit: www.healthed.govt.nz (keyword cervical screening). Human papillomaviruses (HPV) are a common infection, which can cause the development of genital warts and genital tract cancers, including cervical cancer. A publically funded HPV vaccine was introduced in 2008. Ministry of Health figures show that 70% of all young Pacific women born between 1992 and 1996 have begun their course of the HPV vaccine, compared to 52% of all girls in this age group. Three-quarters of Pacific girls born in 1997 have already begun the vaccination course, well ahead of the overall average of 49%. It is hoped that the high vaccination rate will result in a reduction in the rate of cervical cancer among Pacific women in the future. Lewis H. Achieving equity in cervical screening. National Cervical Screening Programme Bulletin. Available from: www.nsu.govt.nz/ (Accessed Nov, 2010). Ministry of Health. National Cervical Screening Programme. Wellington: NSU;2009. Available from: www.nsu.govt.nz/health-professionals/1009.asp (Accessed Nov, 2010). St George I (Ed). Cole's medical practice in New Zealand. 10th Edition. Wellington: Medical Council of New Zealand; 2010. Ministry of Health and Ministry of Pacific Island Affairs. Tapu Ola Moui: Pacific health Chart Book. Wellington:Ministry of Health; 2004. National Screening Unit (NSU). Guidelines for cervical screening in New Zealand. NSU;2008. Available from: www.nsu.govt.nz/health-professionals/2747.asp (Accessed Nov, 2010). National Screening Unit (NSU). Final process and impact evaluation report 2007, Kahui Tautoko Consulting Ltd. Evaluation of the National Cervical Screening Programme and Breastscreen Aotearoa health promotion services. NSU; 2007. Available from: www.nsu.govt.nz (Accessed Nov, 2010). Jameson A, Sligo F, Comrie M. Barriers to Pacific women's use of cervical screening services. Aust N Z J Public Health1999;23(1):89-92. Bethune G, Lewis H. Let's talk about smear tests: Social marketing for the National Cervical Screening programme. Pub Health 2009;123(Suppl1):e17-22.